South Saqqara is completely separate from Saqqara. It is located about one kilometer south of the pyramid of Sekhemkhet, which is the most southern of all the pyramids in Saqqara. 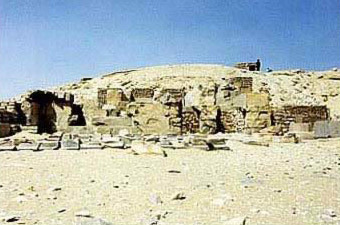 South Saqqara was founded in the 6th Dynasty (2345 - 2181 BC) by the pharaohs. A few of the tombs are interesting and are based on the architecture of the Pyramid of Unas. Most of the tombs have been plundered for their stones by stone-masons or their suppliers of stones. The pyramids of Pepi I and Merenre (Merenre's Pyramid) are in complete ruin. To the east of the pyramid of Merenre is the Pyramid of Pepi II. This pyramid is surrounded by an entire funerary complex. The inner chamber contains inscriptions and stars. There are smaller pyramids in the area as well that belonged to his queens. For example, Djedkare's 5th Dynasty pyramid has an adjoining pyramid that we believe was that of his consort or queen, but unfortunately there is no evidence of this woman's name. They are all designed the same as Pepi's and contain a miniature funerary complex as well. The Pyramid of Queen Neith has some wonderful decorations and inscriptions. To the east of the Pepi II complex is the Mastaba Faraoun, the tomb of Shepseskaf. He was the last Pharaoh of the 4th Dynasty (2613 - 2494 BC). The inside is undecorated and large granite blocks make up the walls. The tomb looks like a huge sarcophagus from the outside. It was originally covered with a thin layer of limestone. Further to the south are two more pyramids. The first belongs to Khendjer. This pyramid is made of brick and has a funerary complex that is made of quartzite. The second pyramid has no inscriptions and is unfinished. It has white stone chambers which are underground and a funerary chamber made of quartzite. No signs of use are found.